Take everything you know about Mardi Gras and throw it out the window. Maybe I’m naive, but I think Mardi Gras can be whatever you make it out to be. All those obscene things you’ve heard about Mardi Gras? They’re completely true and completely false. My family is from South Louisiana, the heart of Cajun Country. In fact, my dad’s first language was Cajun French! I grew up in Texas, so we often went home to Louisiana to visit family at Mardi Gras. For us, Mardi Gras was simply a time to see family. We would visit family and then hit the parades. It was like a family picnic day, almost like waiting for a parade on the Fourth of July. My grandmother would pass out grocery sacks from Winn-Dixie and we would stand there as a family, waiting for the parade to arrive. Once the parade came, we would shout “Throw me somethin’ Mister!” the standard Mardi Gras yell, and then we would await our cache. We loaded our necks up with beads and when we couldn’t hold anymore, we filled up the grocery sacks with beads, cups, and doubloons. Now if you go into certain areas of New Orleans at Mardi Gras, you’ll find something else entirely. Because of all of that, I understand why many folks would rather not celebrate Mardi Gras at all. But my perspective is that the Irish have their St. Patrick’s Day and Cajuns have their Mardi Gras. Would you believe there’s a Christian element to Mardi Gras? The very words mean Fat Tuesday. Ash Wednesday is the day immediately following Mardi Gras, and it’s a time where many Christians, but Catholics especially, will choose one thing to fast for during Lent. And if you’re going to have a fast, then it makes sense to have a feast first, right? And that’s where Mardi Gras comes in. But in many ways, Mardi Gras takes the idea of a feast to complete excess. Still, I will contend that it doesn’t have to be that way. Mardi Gras can be whatever you make it. 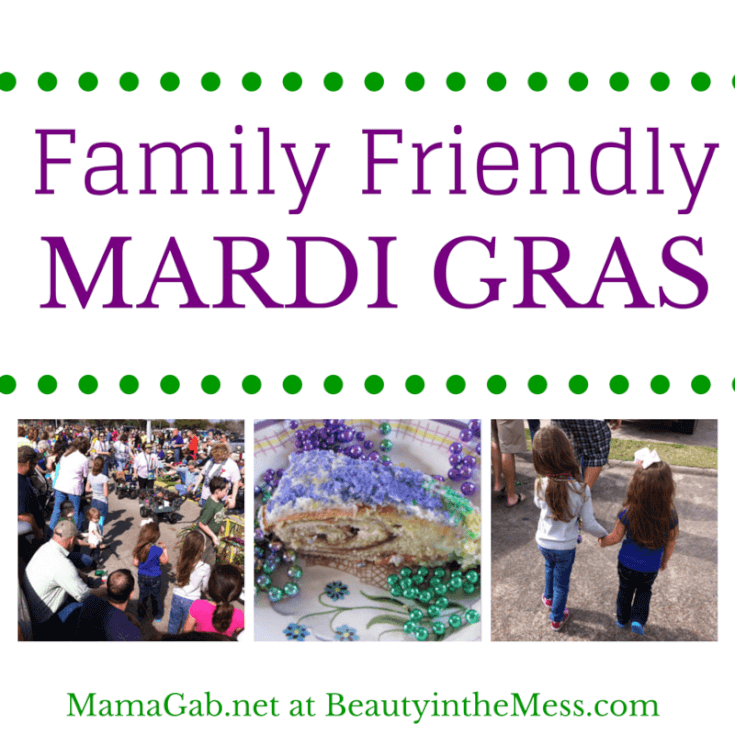 If you want to celebrate Mardi Gras, here are a few ways that you can do that in a family-friendly way. More and more cities around the country are starting their own Mardi Gras traditions. Since these are far from New Orleans, you can be pretty certain that the parades will be clean and family-friendly. If you go to a parade in South Louisiana, simply inquire for family-friendly parades. Some parades even have a specific area for families where no alcohol is permitted. We also find that day parades are a lot cleaner than night parades. Be sure to ask the locals! My husband grew up going to Mardi Gras around New Orleans and he never saw a lot of the things that you hear about because his parents knew where they could bring their kids. Pack lunches and make a day of it! My kids especially enjoy going to the pet parades. Beads may not be thrown, but it’s adorable to see the cute pet costumes that people come up with. Isn’t that the cutest little Yoda dog? Don’t have a local parade near you? Make your own! Your kids can cover shoe boxes in the standard Mardi Gras colors of purple, gold, and green and have your own little parade. Or instead of Mardi Gras colors, have your children decorate shoe boxes to mimic books that they have recently read. We are doing this as part of our homeschool day. I’ll let my daughter make either a Charlotte’s Web shoe box float or a Alice in Wonderland themed float, since we just read these together. I can’t wait to see what she comes up with. We also like to have a dance party for the kids. My husband finds Mardi Gras music on Youtube and lets our little ones dance their sweet little heads off. We’ll even get out a toy drum or a Cajun triangle to let them learn rhythm. 3. Try out a Cajun recipe! If you’re stuck outside of Louisiana for Fat Tuesday, then celebrate in your own way. Find a recipe for authentic gumbo, jambalaya, or red beans and rice. Who knows? It might become a new family favorite. King Cakes are a staple here in South Louisiana. These are either a cinnamon-roll like cake or a doughnutty type of cake, but regardless of the type, you’ll find a baby tucked somewhere into the cake. This symbolizes the kings who followed a star to find the Christ child. If you want to make your own version of a king cake, I’ve got a fabulous recipe that you can try. It’s our favorite. Choose something as a family to give up for the entire 40 days of Lent. If you choose to give up sugar, caffeine, your weekly pizza night, or television, then use the money saved to donate to your favorite charity. Learn about the connection between fasting and prayer so that you can carry out your fast in a way that brings you closer to God. For example, you can use your usual morning coffee time to have deeper prayer time. Every time you long for caffeine, ask the Lord to help you long for Christ that way too. Whatever it is you choose to give up, you can celebrate by indulging in it on Mardi Gras. Feasting and fasting is what Fat Tuesday is really all about. Have you ever celebrated Mardi Gras? What’s your favorite way to celebrate? I grew up outside Mobile and really miss Mardi Gras now that I’m in South Florida. Lucky for me, my priest is from NOLA and he brought the tradition with him to our church. We just had a big procession last Sunday (because he’ll be in NOLA next weekend) and we’ve had a jambalaya dinner. We will have a big Fat Tuesday/ Shrove Tuesday dinner too. I love that we can make Mardi Gras a family event, even if we aren’t in the area anymore. I just made my first king cake and it turned out all right. I’m going to have to try your recipe next! We always order one from Haydel’s too! Awesome tips! You made me miss Mardi Gras even more! Thanks, Hannah! We’ve been away from the Gulf Coast for the past 15 years, so this is our first year to be back in South Louisiana. We are LOVING all the parades! Anyway, I completely feel your pain. We had to make our own Mardi Gras fun during all those years we lived away.